Edinburgh based 'Riddlah' has been working with Sons of Scotland (SOS) for many years, featuring and producing on various releases. After having many projects released himself via UVBeatz, and also working close with Steg G at 'Powercut Productions', now comes his first solo release with SOS... and that's CERTIFIED. Beat production from; Asteria, Savage Sound System, Scant Squad, Cab, Strut & Thomson. 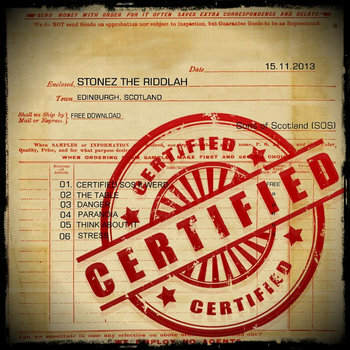 Artwork, Recorded, Mixed and Mastered by Drew Devine aka Werd at SOS Studio, Edinburgh.